Protects alternator from massive spikes caused when a cable is loose or a fuse blows. 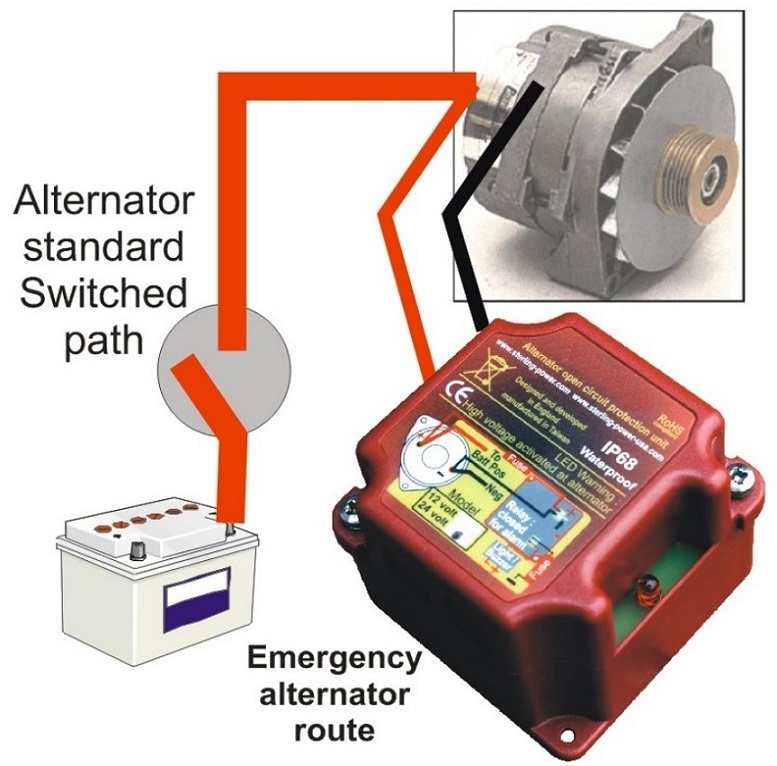 Works with any alternator or splitting device (12V or 24V). Loose wires causing an alternator wire to become undone/loose causing sparking. Failure in a split diode/relay charging system, open circuiting this system. Someone switching off engine’s electrical power when engine is actually running. Defective rotary battery selection switch causing arcing during rotation. Failure of a fuse if fitted in the alternator’s circuit. All of the above events could easily destroy your alternator’s sensitive parts, this device will prevent this by diverting any high spike build up to earth. This is effective from full power to no power fault events on the alternator. Most alternator regulators and internal diode packs will be damaged by spikes in excess of 40V. The 12V or 24V Alternator Open Circuit Protection Device is designed to absorb spikes in excess of 18V (12V) and 36V (24V systems). 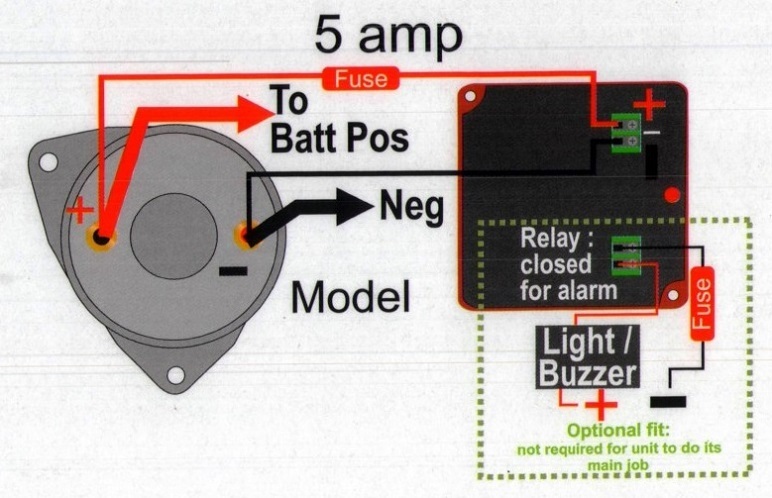 Simply connect the positive/negative output connection from the 12V or 24V Alternator Open Circuit Protection Device to the positive/negative output of the alternator. It’s always best to connect the device ring terminal to the inside of the bolts of the alternator’s main power cables. There will already be the main alternator outputs on the alternator’s stud. For maximum protection remove the main cables after (thus sandwiching in the protection cable). If the tensioning nut on the main cable becomes loose the main cable will fall off first leaving the protection device on the alternator, this will save the alternator. If the 12V or 24V Alternator Open Circuit Protection Device cable is on top of the live cable (not held in by the live cable) then, when the device cable falls off, the alternator will not be protected. In the event there are no nuts then it’s up to the installer to connect the wires as close as possible to the alternator’s main power output. The closer the 12V or 24V Alternator Open Circuit Protection Device wires are fitted the more possible events it can protect for. 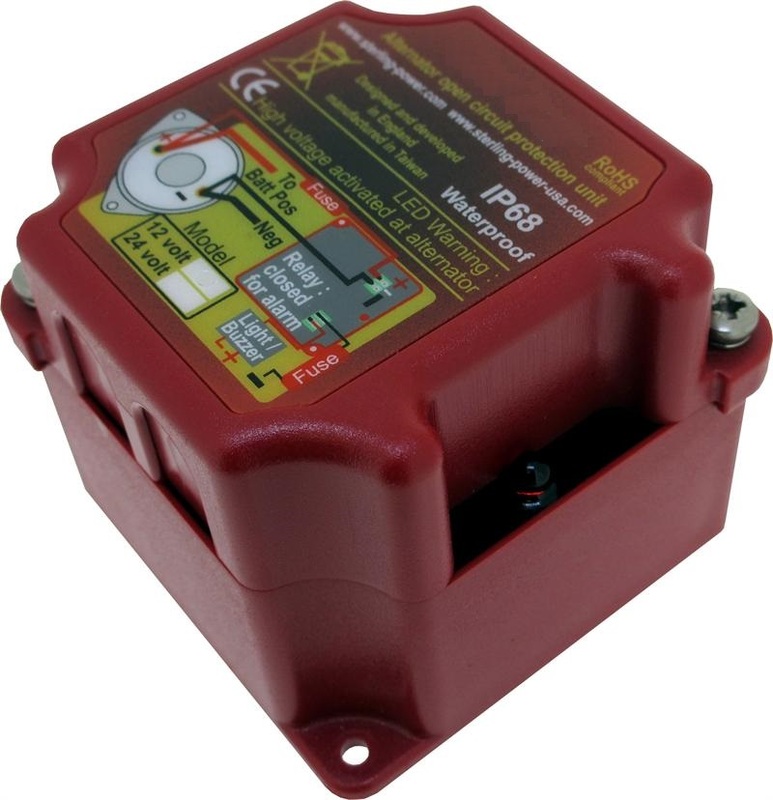 The red LED (high voltage warning) will illuminate if alternator voltage is between 16.0 to 16.5V and over (12V unit) or 32.0 to 33.0V and over (24V unit). WARNING only given for high voltage at alternator, this is an event we cannot protect for. If this WARNING is given, the engine should be shut down immediately and should be investigated and the high voltage source should be identified and rectified. In the event of spike protection being engaged there is no event LED to indicate this due to its extremely high voltage and extremely low duration. The device will simple do its job and protect the alternator. The warning is more for a long term voltage fault. If the alternator’s own regulator fails for normal reasons and the alternator’s voltage rises, the LED will simply warn of the high voltage at the alternator, this device cannot actually stop the high voltage from occurring. There are 2 ways to get an exact quote for the base shipping for your 12V or 24V Alternator Open Circuit Protection Device order. We’ll research the exact shipping cost and send you an invoice to your PayPal or email or you can add it to your pallet in $1 Shipping Increments for your 12V or 24V Alternator Open Circuit Protection Device order. Quantity discounts show in the “Shopping Pallet”.